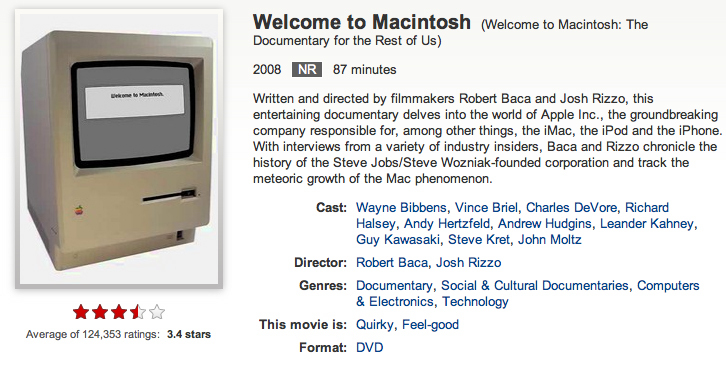 Welcome to Macintosh is a movie produced by Rob Baca (of Ohio) and Josh Rizzo (of California) all the way back in 2008. One of the featured in it is me! They billed me as "the Collector" and that's probably because of the HUGE collection of vintage Apple and Macintosh hardware and software that I have collected, and not thrown away, since the late 70's. The movie is a documentary and is a time treasure. It was the iTunes #1 documentary download the summer of 2009 and has been broadcast of television more than 1/2 dozen times. We do sell the DVD's for $14 to those that would like an autographed DVD. If interested just drop me an e-mail and we'll make it happen.